The superior paraolivary nucleus (SPON) is a prominent structure in the auditory brainstem. In contrast to the principal superior olivary nuclei with identified roles in processing binaural sound localization cues, the role of the SPON in hearing is not well understood. A combined in vitro and in vivo approach was used to investigate the cellular properties of SPON neurons in the mouse. Patch-clamp recordings in brain slices revealed that brief and well timed postinhibitory rebound spiking, generated by the interaction of two subthreshold-activated ion currents, is a hallmark of SPON neurons. The Ih current determines the timing of the rebound, whereas the T-type Ca2+ current boosts the rebound to spike threshold. This precisely timed rebound spiking provides a physiological explanation for the sensitivity of SPON neurons to sinusoidally amplitude-modulated (SAM) tones in vivo, where peaks in the sound envelope drive inhibitory inputs and SPON neurons fire action potentials during the waveform troughs. Consistent with this notion, SPON neurons display intrinsic tuning to frequency-modulated sinusoidal currents (1–15Hz) in vitro and discharge with strong synchrony to SAMs with modulation frequencies between 1 and 20 Hz in vivo. The results of this study suggest that the SPON is particularly well suited to encode rhythmic sound patterns. Such temporal periodicity information is likely important for detection of communication cues, such as the acoustic envelopes of animal vocalizations and speech signals. The superior paraolivary nucleus (SPON) is located within the superior olivary complex in the mammalian auditory brainstem. Whereas most nuclei in this area are associated with the processing of spatial acoustic information (for review, see Grothe et al., 2010; Tollin, 2003), the function of the SPON is less well studied. Structures homologous to the SPON have been identified in all species examined thus far, including humans (Bazwinsky et al., 2003; Kulesza, 2008; Kulesza et al., 2010; Schmidt et al., 2010), suggesting that this structure has been preserved in mammalian evolution to fulfill a fundamentally important role in audition. The SPON receives excitatory inputs from octopus and multipolar stellate cells in the contralateral cochlear nucleus (Friauf and Ostwald, 1988; Kuwabara et al., 1991; Thompson and Thompson, 1991; Schofield, 1995) (see Fig. 1A). The contralateral cochlear nucleus also drives a strong feedforward glycinergic inhibition from the ipsilateral medial nucleus of the trapezoid body (MNTB) to the SPON (Moore and Caspary, 1983; Sommer et al., 1993; Smith et al., 1998, Kulesza et al., 2007) (see Fig. 1A). Pharmacological blockade of glycine receptors in the SPON in vivo demonstrates that inhibition is essential for generating transient offset responses (Kulesza et al., 2007), which are characteristic of SPON neurons in rabbit (Kuwada and Batra, 1999), rat (Kulesza et al., 2003), and gerbil (Dehmel et al., 2002) (but see Behrend et al., 2002). SPON neurons also phase-lock with high precision to the envelopes of amplitude-modulated sounds (Kuwada and Batra, 1999; Kulesza et al., 2003; Kadner and Berrebi, 2008) and respond to very short gaps in tones (Kadner and Berrebi, 2008), rendering them ideally suited for encoding temporal features of sounds. To shed light on the cellular mechanisms underlying the offset responses of SPON neurons, we investigated their physiological properties by combining patch-clamp recordings in vitro with single-unit recordings in vivo in the mouse. We demonstrate that SPON neurons display prominent and well timed postinhibitory rebound spikes, which depend on two subthreshold-activated ion currents, namely Ih and low-voltage-activated T-type Ca2+ currents. 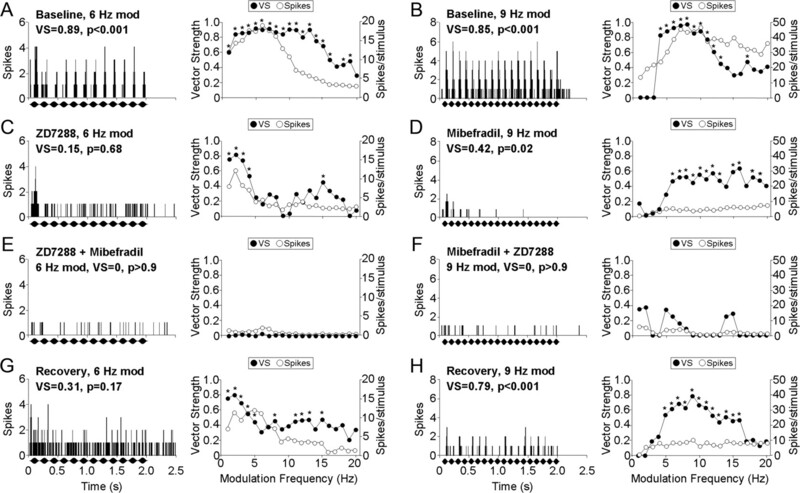 SPON neurons also show preferential tuning to low-frequency-modulated current injections in vitro and phase-locking to 1–20 Hz amplitude-modulated sound envelopes in vivo. We conclude that SPON neurons encode periodic acoustic stimulus patterns with a postinhibitory rebound mechanism and propose that the SPON serves to extract and encode acoustic rhythms. Mice of the C57BL/6 strain [age, postnatal day 5 (P5) to P18] were decapitated under sodium pentobarbital anesthesia in conformity with the rules set by the European Commission Council Directive (86/89/ECC) and approved by the local Swedish Animal Care and Use Committee (Permit N13/10). The brainstem was carefully removed and placed in ice-cold low-sodium, high-sucrose artificial cerebrospinal fluid (aCSF; see below). Transverse brainstem slices containing the superior olivary complex (Fig. 1A) were obtained at a thickness of 150–200 μm using a Vibratome (VT1200; Leica) and incubated at 32°C in normal aCSF (see below) for 20–30 min, after which they were allowed to cool to room temperature. Recordings were obtained within 4–5 h of the brain slice preparation. The recording site was carefully noted on a schematic drawing of the area after each recording and before removing the pipette from the tissue. The low-sodium, high-sucrose aCSF contained (in mm) 85 NaCl, 2.5 KCl, 1.25 NaH2PO4, 25 NaHCO3, 75 sucrose, 25 glucose, 0.5 CaCl2, and 4 MgCl2, whereas the normal aCSF contained (in mm) 125 NaCl, 2.5 KCl, 1.25 NaH2PO4, 26 NaHCO3, 25 glucose, 2 CaCl2, and 1 MgCl2. These solutions were bubbled continuously with carbogen gas (95% O2–5% CO2), setting the pH to 7.4. For current-clamp and voltage-clamp recordings, the internal pipette solution contained (in mm) 130 K-gluconate, 5 KCl, 10 HEPES, 1 EGTA, 2 Na2-ATP, 2 Mg-ATP, 0.3 Na3-GTP, and 10 Na2-phosphocreatinine, adjusted to pH 7.3 with KOH. The following pharmacological agents were used: ZD7288, Mibefradil, tetrodotoxin (TTX) (Tocris Cookson), and QX-314 (Sigma-Aldrich). All of these drugs were dissolved in distilled H2O (10 mm), stored at −20°C, diluted, and added to the aCSF during the experiment. Slices were transferred to a recording chamber perfused (∼3 ml min−1) with oxygenated aCSF at room temperature (25 ± 2°C). Putative SPON principal cells were viewed with an upright microscope (Axioscope; Zeiss) equipped with a digital CCD camera (Orca 2; Hamamatsu) using a 40× water-immersion objective (Achroplan; Zeiss) and infrared-differential interference optics. The SPON cells were visually identified by their large somata in a clearly delineated area medial to the lateral superior olive. Neuron size was estimated from the capacitance compensation measurement under voltage clamp. Only large neurons with a capacitance >20 pF were included in the analysis. Whole-cell current- and voltage-clamp recordings were performed with a Multiclamp 700B amplifier (Molecular Devices) using borosilicate glass microelectrodes with a final tip resistance of 5–10 MΩ. The bridge balance was applied for current-clamp recordings. During voltage-clamp recordings, the series resistance was compensated by 70–80%, and recordings showing changes >10% were discarded. All voltages were corrected for a liquid junction potential (LJP) of 11.6 mV by using the following formula: Vmem = Vrec − LJP. To rule out possible differences in cellular properties of SPON neurons in C57BL/6 and CBA/CaJ mice, used respectively in the in vitro and in vivo experiments, brain slices were prepared from CBA/CaJ mice (P5–P14). Within this age range, the two strains were statistically equivalent in postinhibitory rebound spiking, measured as the maximal number of rebound spikes (C57BL/6: 1.4 ± 0.1, n = 46; CBA/CaJ: 1.6 ± 0.1, n = 31; p = 0.20), the rebound duration (C57BL/6: 94 ± 7 ms, n = 46; CBA/CaJ: 77 ± 14 ms, n = 31; p = 0.25), and the latency to the first rebound spike (C57BL/6: 26 ± 3 ms, n = 46; CBA/CaJ: 28 ± 6 ms, n = 31; p = 0.67). There was also no difference in the intrinsic tuning to 1–15 Hz chirp stimuli (C57BL/6: 8.2 ± 0.8 Hz, n = 31; CBA/CaJ: 8.8 ± 0.9 Hz, n = 19; p = 0.68). Recorded signals were filtered with a low-pass four-pole Bessel filter at 10 kHz, sampled at 20 kHz, and digitized using a Digidata 1422A interface (Molecular Devices). Stimulus generation, data acquisition, and off-line analysis of data were performed using the pClamp software (version 10.2; Molecular Devices) or IgorPro (version 6.12A; WaveMetrics). where Ioff is the offset current, Imax is the maximal tail current, V is the test voltage, Vhalf is the half-activation voltage, and k is the slope of the Boltzmann function. The chirp stimuli were generated in MatLab, imported into the amplifier software, and scaled appropriately with the gain function. Results are expressed as mean ± SE of the mean in the text and as mean ± 95% confidence intervals in the figures, unless stated otherwise. The level of significance was determined by Student's paired or unpaired t test (p < 0.05 was considered statistically significant). SPON cells were patched and loaded with the calcium indicator Calcium Green-1 (50–100 μm; Kd = 190 μm; Invitrogen) via the pipette solution. The dye was allowed to diffuse into the cell for 10 min before the recordings commenced. Dye-filled SPON cells were illuminated with 450–490 nm light and filtered through a series of neutral density filters to reduce the light intensity to 5%, which yielded bright fluorescence with a stable baseline throughout the recordings. Images were acquired with a cooled CCD camera (Orca-2; Hamamatsu) at a speed of 18.5 Hz. The image acquisition was synchronized with electrophysiological recordings, triggered by the onset of each stimulus epoch. The images were analyzed with custom-written Matlab scripts. Fluorescence background values were subtracted from the average fluorescence in a region of interest covering the cell soma. The Ca2+ response was reported as an increase in ΔF/F of the defined region of interest. Mice were deeply anesthetized with an overdose of sodium pentobarbital, followed by transcardial perfusion with a brief rinse of saline, followed by ice-cold 4% paraformaldehyde (PFA) in 0.1 m PBS. Brains were then dissected, postfixed for 3 h in 4% PFA at 4°C, and transferred to 30% sucrose in 0.1 m PBS at 4°C overnight. Brains were sectioned into 30 μm transverse slices on a cryostat (model CM3050 S; Leica Microsystems). For the staining procedure, sections were rinsed three times for 10 min in 0.1 m PBS and thereafter preincubated in 5% normal donkey serum (Jackson ImmunoResearch Laboratories) in blocking solution (1% bovine albumin serum and 0.3% Triton X-100 in 0.1 m PBS) for 1 h at room temperature. Sections were incubated in 2% normal donkey serum in blocking solution overnight at 4°C with one of the following primary antibodies: polyclonal rabbit α-HCN1 (1:250, lot number AN-10; Alomone Labs), which is directed against amino acid residues 6–24 of the intracellular N terminus of rat HCN1 (GenBank accession number Q9JKB0); polyclonal rabbit α-HCN2 (1:400, lot number AN-08; Alomone Labs), directed against amino acids 147–161 of the intracellular N terminus of human HCN2 (GenBank accession number Q9UL51); or monoclonal mouse α-HCN2 (1:400, clone N71/37; NeuroMab, UC Davis/NIH NeuroMab Facility) directed against amino acids 761–863 of the C terminus of rat HCN2 (GenBank accession number Q9JKA9) used in combination with a mouse-on-mouse kit (Vector Laboratories). The following day, sections were washed three times with PBS followed by incubation in darkness with Cy2-conjugated donkey α-rabbit secondary antibody (Dianova) in blocking solution for 2 h at room temperature. Finally, sections were washed with PBS, mounted onto glass slides with an anti-fading medium, and kept in the dark at −20°C until visualization. Control experiments with the primary antibody either (1) omitted (n = 3) or (2) preincubated with the control peptide antigen (n = 3) led to the complete loss of immunoreactivity for HCN1 and HCN2 antibodies (data not shown). Sections were examined with a fluorescence microscope (Observer Z1; Zeiss) equipped with a digital camera (AxioCam MRm; Zeiss). Immunolabeling was identified with a green fluorescence filter (excitation, 450–490 nm; emission, 520–560 nm), and images were acquired and digitally processed using AxioVision 4.8 software (Zeiss). Twenty female CBA/CaJ mice aged P20–P80 (The Jackson Laboratory) were used for in vivo recordings. All animal care and use procedures were in accordance with the National Institutes of Health Guide for the Care and Use of Laboratory Animals and were approved by the West Virginia University Institutional Animal Care and Use Committee. Mice were anesthetized with a mixture of ketamine (70 mg/kg) and xylazine (5 mg/kg) and placed in a stereotaxic frame where the scalp overlying the skull was cut and reflected laterally. A lightweight metal headpost was attached to the skull using dental cement, and a craniotomy, approximately 1–2 mm in diameter, was made over the cerebellum to gain access to the brainstem [see Portfors and Felix (2005) for details of the surgical technique]. After the surgery, animals were moved to a sound-attenuated chamber where the headpost was connected to a stereotaxic device that rendered the head immobile and maintained a consistent head position during the recordings. The core body temperature was maintained at 37°C throughout the experiment using a thermostatically controlled heating pad (FHC). The depth of anesthesia was carefully monitored each time the electrode was repositioned by observing the response to a foot pinch. In rare cases when the anesthetic state became light, an injection of ketamine at one-third the original dose was administered. Topical lidocaine (5%) was applied to the wound margins every 2 h.
Stimulus generation and data acquisition were controlled by custom-written software (BATLAB; Donald Gans, Northeast Ohio Universities College of Medicine, Rootstown, OH). Stimulus waveforms were output through a 16-bit digital-to-analog converter (400,000 samples/s; model DAP521a; Microstar Laboratories), and analog signals were sent to an anti-aliasing filter [FT6-2; Tucker-Davis Technologies (TDT)] and fed to a programmable attenuator (PA-5; TDT). Signals were then routed to speaker drivers (ED1; TDT) and presented to the animal through free-field speakers (ES1; TDT) placed 5 mm from the opening of each ear. The speaker output was calibrated off-line over a range of 0.5–60 kHz using a measuring amplifier (model 2610; Brüel & Kjær) connected to a condenser microphone (model 4939; Brüel & Kjær) positioned at the location normally occupied by the animal's head. Single-unit extracellular recordings were conducted with glass pipettes (2–4 μm tip diameter) filled with 0.5 m NaCl recording solution (10–20 MΩ resistance). The SPON was targeted using stereotaxic coordinates obtained from an atlas of the mouse brain (Paxinos and Franklin, 2001). Once the electrode penetrated the brain, neuronal activity was amplified (model 2400; Dagan Corporation), bandpass filtered (200–3000 Hz; model 3364; Krohn-Hite), and digitized by a 16-bit analog-to-digital converter (42 kHz; DAP5216a; Microstar Laboratories). Individual raw waveforms were recorded in BATLAB and stored for off-line analysis. Bursts of broadband noise (50 ms duration, ∼80 dB SPL, four presentations per second) were used as search stimuli. Based on previous anatomically verified recordings in the SPON of mice (Felix and Berrebi, 2007) and rats (Kulesza et al., 2003; Kadner and Berrebi, 2008), only responses that were driven by contralateral stimulation and triggered by the stimulus offset were considered to be from the SPON. Once a single unit was isolated, its characteristic frequency (CF; the frequency requiring the lowest intensity to elicit an evoked response) and its minimum threshold (the lowest intensity required to elicit a response) were determined. Peristimulus time histograms (PSTHs) were constructed by presenting 100 repetitions of a pure tone (50 ms duration) at the unit's CF, 20 dB above threshold. When spikes triggered by the stimulus onset and offset were examined independently, the time window for capturing spikes that occurred during the tone presentation was set at 0–50 ms from the onset, whereas the offset response was windowed from 5 to 35 ms from the end of the stimulus. where ai is the phase angle of spike i relative to the modulation cycle of the stimulus and n is the total number of spikes in the analysis window (Goldberg and Brown, 1969). A vector strength of 1 indicates perfect synchronization between the neuronal response and the modulation phase, whereas a vector strength of 0 indicates no correlation. The Rayleigh test (Batschelet, 1981) was used to determine whether spike distributions relative to the phase angles of stimuli differed significantly from randomness. To minimize the influence of isolated action potentials that were time-locked to the onset of the SAM tone (and therefore occurred at a constant phase angle), the vector strength was set to 0 if the unit's spike count fell below two spikes per presentation (Kadner and Berrebi, 2008). For iontophoresis experiments, recordings were made with “piggyback” electrodes (Havey and Caspary, 1980; Kulesza et al., 2007) consisting of a single-barrel recording pipette glued onto a five-barreled glass pipette used for drug delivery (15–25 μm total tip diameter). One barrel of the electrode was used as a sum channel, whereas the remaining four barrels were loaded with ZD7288 (30 mm, pH 4.0; Sigma) or Mibefradil (10 mm, pH 3.5–4.0; Sigma). All drugs were dissolved in 0.165 m NaCl, and retention and ejection currents for each drug solution were controlled by a micro-iontophoresis unit (model 6400; Dagan) located outside the recording chamber. While searching for SPON neurons, a retention current of −10 nA was continually applied to prevent drug leakage from the electrode tip. After the isolation of a unit and the recording of baseline activity, drugs were ejected with currents ranging from +25 to +40 nA for a period ranging from 10 to 25 min. Maximal drug effects were signaled by changes in the neuron's spiking pattern that remained stable for 3 consecutive minutes. After data were collected for the drug conditions, the ejection current was terminated, the retention current was reapplied, and the drugs were allowed to wash out, followed by collection of data in the recovery condition. In cases in which a unit was lost before recovery, 30 min elapsed before the electrode was moved to search for another neuron. The responses of 55 SPON neurons to injections of depolarizing and hyperpolarizing current pulses were investigated in vitro. Neurons were sampled from throughout the SPON, and they exhibited stable resting membrane potentials (mean resting membrane potential, −65 ± 0.7 mV) throughout the recordings and all had fast-rising, overshooting spike amplitudes (mean spike amplitude, 68 ± 1.4 mV). Current-step injections around the resting potential were used to estimate the input resistance (116 ± 8.6 MΩ), the membrane time constant (15 ± 1.4 ms), and the membrane capacitance (116 ± 10 pF). SPON cells were never spontaneously active in vitro, but depolarization from rest elicited highly variable spike patterns (data not shown). In contrast, in all recorded SPON neurons, hyperpolarizing currents triggered consistent responses, namely prominent rebound depolarization (RD), which reached threshold for fast action potentials (Fig. 1B) [for definition of RD, see Aizenman and Linden (1999)]. Therefore, this study focuses on the effects of hyperpolarization in these neurons. Most cells (47 of 55) had precisely timed RD that resulted in only one or two action potentials, independent of stimulus amplitude (Fig. 1B,C). Interestingly, in what seems to be a distinct subclass of SPON cells (n = 8), the RDs resulted in complex spike patterns with one overshooting action potential followed by several small spikelets (Fig. 1D). This less common spiking response was restricted to neurons located in the dorsolateral quadrant of the SPON, corresponding to the low-frequency region in vivo (Kulesza et al., 2003). Quantitative comparisons of these subtypes revealed no differences in resting membrane potential, input resistance, capacitance, latency to the first spike, or RD duration; data from both rebound types were therefore pooled. SPON neurons display precisely timed postinhibitory rebound spiking. A, Schematic diagram of SPON circuitry. SPON neurons receive excitatory inputs from octopus cells and multipolar stellate cells in the contralateral ventral cochlear nucleus (VCN). Globular bushy cells in the same VCN drive the inhibitory, glycinergic MNTB projection to the SPON. The vertical dashed line indicates the midline. B, Responses to hyperpolarizing current injections applied in 100 pA increments to an SPON neuron demonstrate the low variability in the latency of the rebound spikes at three current levels. C, Schematic diagram of superior olive shows location of SPON neurons characteristically displaying one or two rebound spikes. D, A subset of SPON neurons displayed a complex rebound spiking pattern with an overshooting spike followed by a few small spikelets (arrowheads). A reconstruction of the distribution of these neurons reveals their location in the dorsolateral quadrant of the SPON. E, Responses to a series of hyperpolarizing currents varying in amplitude (between 0 and −220 pA in −10pA current increments) or duration (between 0 and 260 ms in 10 ms increments with an amplitude of −80 pA in an SPON neuron). F, The average normalized RD area (the integral of the RD response overshooting the resting membrane potential) increases proportionally with increasing current amplitudes. G, The average normalized latency of the peak RD response is plotted as a function of current level. Larger current injections result in earlier RD responses (n = 28). H, The average normalized RD area increases in a linear fashion up to 150 ms durations, after which the response saturates. I, The average normalized latency to the peak RD decreases exponentially with a time constant of 50 ms with increased hyperpolarization duration (n = 28). The average number of overshooting spikes at the maximal RD response for the entire population of SPON neurons was 1.4 ± 0.1 (n = 55), indicating that a brief RD spiking response is a very robust property of these neurons. The RD spiking response peaked within 5–60 ms (23 ± 2.4 ms; n = 55) after the offset of the hyperpolarizing current step and lasted for 83 ± 6.8 ms (range, 7–152 ms; n = 55). To systematically investigate how the hyperpolarization affects the RD response, a series of hyperpolarizing current injections at 10 pA increments (Fig. 1E) were used. The area of the RD (above the resting membrane potential) increased in proportion to the hyperpolarization amplitude with a half-maximal current of 90 pA (Fig. 1F). The latency to the RD peak response decreased exponentially with hyperpolarizing amplitude with a similar half-maximal current of 87 pA (Fig. 1G). To assess the effects of the hyperpolarization duration on the RD, the time course of a hyperpolarizing step of fixed amplitude was varied from 0 to 260 ms in 10 ms increments (Fig. 1E). The RD area increased proportionally with the hyperpolarizing durations up to 150 ms, after which the response saturated (Fig. 1H). The RD latency decayed exponentially as a function of the hyperpolarization duration with a time constant of 50 ms (Fig. 1I). The variability in these data, as indicated by the small confidence intervals, was low, confirming that the RD is a consistent feature of SPON neurons. All SPON neurons displayed a prominent depolarizing voltage sag in response to the onset of the hyperpolarizing current pulses (Fig. 1E). This voltage sag is indicative of the hyperpolarization-activated inward cation current (Ih) that is implicated to play a role in RDs of other auditory neurons (Sivaramakrishnan and Oliver, 2001; Koch et al., 2004 or Koch and Grothe, 2003; Tan et al., 2007; Sun and Wu, 2008; Nagtegaal and Borst, 2010). In rats, the lateral superior olive (LSO) and the SPON predominantly express the HCN1 and HCN2 subunits of the hyperpolarization-activated cyclic nucleotide-gated channel complex (Koch et al., 2004; Notomi and Shigemoto, 2004). Immunohistochemistry was used to investigate the expression of both subunits in the mouse SPON. The antiserum directed against HCN1 produced robust staining in the somata (Fig. 2A, arrowheads) and dendrites (Fig. 2A, arrow) of neurons throughout the SPON. Likewise, the antiserum directed against HCN2 also generated strong immunolabeling in SPON neurons (Fig. 2B, arrowheads). 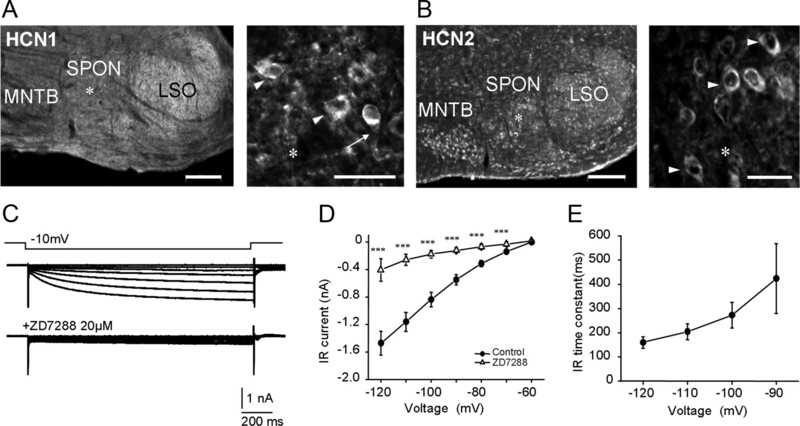 SPON neurons express HCN1 and HCN2 channels and have large Ih inwardly rectifying (IR) currents. A, HCN1 immunoreactivity in the superior olivary complex of an adult mouse. The low-magnification micrograph illustrates that the lateral superior olive expresses the strongest HCN1-like immunostaining, the SPON displays moderate levels of expression, and the MNTB shows the weakest immunoreactivity. At higher magnification, it is evident that both somata (arrowheads) and dendrites (arrow) of SPON neurons are immunopositive. Asterisks denote landmarks in slice. Scale bars: left, 200 μm; right, 50 μm. B) HCN2 is most strongly expressed in the MNTB, whereas expression in the LSO is weakest. At higher magnification, it is evident that SPON neurons are also immunopositive. Asterisks denote landmarks in slice. Scale bars: left, 200 μm; right, 50 μm. C, Current traces recorded from an SPON neuron induced by hyperpolarization from a holding current of −62 to −122 mV, in −10 mV voltage steps, under control conditions (top) and during pharmacological blockade of Ih with 20 μm ZD7288 (bottom). D, The size of the IR current was measured at steady state (i.e., ∼1.35 s after induction) at each hyperpolarizing voltage (n = 42). The IR currents were significantly diminished by ZD7288 (n = 6) in the SPON neurons. ***p < 0.001, Student's t test. E, Average activation time constants of the IR currents in SPON neurons were obtained by fitting a single-exponential function to the current traces. The magnitude of inwardly rectifying currents was measured during hyperpolarizing voltage steps, when large sustained inward currents were observed in SPON neurons (Fig. 2C). At a steady state of −120 mV, this inward current amplitude measured, on average, 1.50 ± 0.09 nA (n = 42) (Fig. 2C), and it was abolished by the Ih antagonist ZD7288 (Fig. 2C,D; 20–50 μm; n = 6). Activation kinetics of the inward current were estimated by fitting single-exponential functions, which revealed an average time constant of 160 ± 12 ms at −120 mV (n = 42) (Fig. 2E). Such intermediate time constants are compatible with heterodimers of HCN1 and HCN2 isoforms (Chen et al., 2001; Ulens and Tytgat, 2001), which is supported by the immunolabeling results. To investigate the contribution of other currents to the activation of the RD, we measured currents induced at the stimulus offset in response to hyperpolarizing steps in voltage-clamp mode, which triggered large inward currents (Fig. 3A). These currents were reduced by <20% by adding the Na+ and Ih blockers TTX and ZD7288, respectively (Fig. 3A). The remaining currents were efficaciously antagonized by Ni2+ (100–300 μm), a known blocker of low-voltage-activated (LVA) Ca2+ currents (Perez-Reyes, 2003) (Fig. 3A,B; n = 5). These results demonstrate that SPON neurons express LVA Ca2+ currents at the offset of hyperpolarization. The average LVA Ca2+ current isolated with TTX and ZD7288 at the offset of a hyperpolarization to −120 mV was −627 ± 468 pA (n = 9). Although there was large variability in the size of this current (range, −222 to −1546 pA), this parameter was not correlated with the number of RD spikes (R2 = 0.0203) or RD duration (R2 = 0.0356). The voltage dependence of the steady-state inactivation of the LVA Ca2+ current was estimated by fitting a Boltzmann function to the normalized currents, which generated a half-inactivation voltage, V1/2 = −92.1 mV, with a slope factor of 6.3 (Fig. 3C; n = 9). This indicates that most of the LVA Ca2+ channels in SPON neurons are inactivated at rest and require strong hyperpolarization to reactivate, consistent with the RD dependence on strong or long hyperpolarizations (Fig. 1E). LVA Ca2+ currents of T type contribute to the RD response in SPON neurons. A, Voltage-clamped SPON neurons were stepped to −120 mV in 10 mV steps from a holding potential of −60 mV and depolarized back to −60 mV, which triggered large inward currents underlying a rebound response in control conditions (left; n = 9). These rebound currents were partially reduced by TTX (1 μm) and ZD7288 (20 μm; middle) but dramatically reduced by the LVA Ca2+ channel blocker Ni2+ (right). B, Average rebound current in SPON neurons at hyperpolarizing voltages when isolated with TTX and ZD7288 (black symbols; n = 12) and after application of Ni2+ (gray symbols; n = 5; **p < 0.01, Student's t test). C, Voltage dependence of the steady-state inactivation (n = 9) was estimated by fitting a Boltzmann function to the normalized currents, which generated a V1/2 of −92 mV and a slope factor of 6.3. D, Ca2+ measurements from the soma of an SPON neuron during a RD response triggered by preceding hyperpolarizing current injections in −100 pA steps. The horizontal black bar marks the duration of the hyperpolarization. E, Normalized average peak ΔF/F as a function of the amplitude of the preceding current step triggering the RD response (n = 6). F, Somatic Ca2+ transients are almost abolished by Mibefradil, indicating that T-type LVA Ca2+ currents are active in SPON somata during the RD response. To determine whether LVA Ca2+ currents contribute to the somatic Ca2+ response during the RD, a series of Ca2+-imaging experiments were also conducted. Analysis of the relative increase in fluorescence compared with background levels (ΔF/F) showed that the RD response generates robust Ca2+ transients (Fig. 3D) that increase systematically with the magnitude of the hyperpolarizing current (Fig. 3E). Moreover, a large part of these Ca2+ transients are blocked by Mibefradil (Fig. 3F), a specific antagonist of T-type Ca2+ channels (Bezprozvanny and Tsien, 1995). Only a small fraction of the ΔF/F, triggered by a −300 pA hyperpolarizing step, remains after blockade with 3 μm Mibefradil (control, 14.5 ± 3.9; Mibefradil, 1.1 ± 0.9; n = 6; p < 0.01). 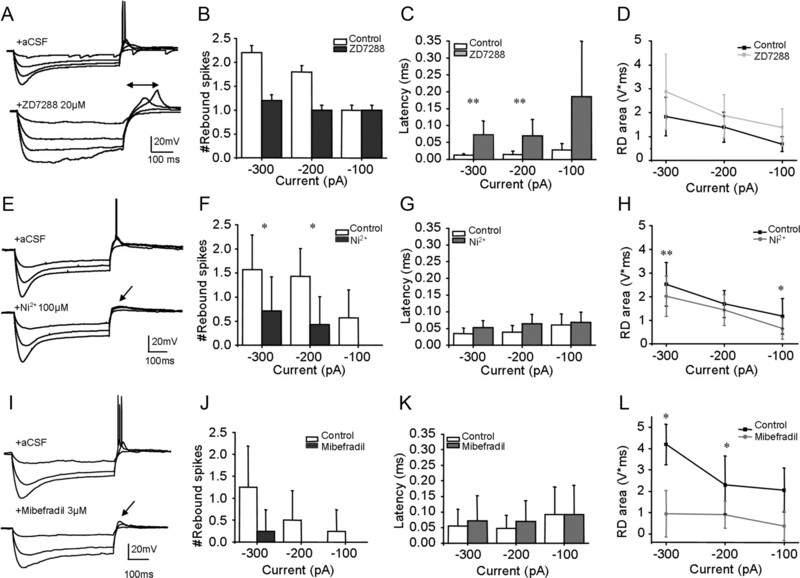 These results demonstrate that Ih currents and T-type LVA Ca2+ currents work in tandem to generate the temporally precise RD spiking in SPON neurons. We next investigated the contribution of the Ih and LVA Ca2+ currents in the RD response by applying pharmacological antagonists in current clamp. Blocking Ih currents with bath application of ZD7288 (20–50 μm) abolished RD spiking in some neurons (Fig. 4A; n = 8), but not in others, and therefore the reduction in RD spiking was not statistically significant (Fig. 4B). The main effect of antagonizing Ih was a wider, less temporally precise RD (Fig. 4A), which manifests as a significantly longer RD latency (Fig. 4C). As a result of the wider response, the RD area increased somewhat with application of ZD7288 (Fig. 4D). These results indicate that Ih is an important contributor to generating the RD and that it determines the latency of the RD. Ih and LVA Ca2+ currents have complementary roles in the RD response of SPON neurons. A, Top, Voltage responses of an SPON neuron to hyperpolarizing current injections in −100 pA steps in aCSF. Bottom, Voltage response of the same neuron during pharmacological blockade of Ih with ZD7288 (20 μm). The horizontal bar with arrowheads indicates the increase in latency to peak response compared with the control condition. B, C, Average number of RD spikes (B) or latency to peak RD response (C) before (open columns) and after (filled columns) application of ZD7288 at three different current levels. D, Average RD area (above resting membrane potential) before (black symbols) and after (gray symbols) application of ZD7288 at three different current levels. E, Top, Voltage response of an SPON neuron to hyperpolarizing current injections in −100 pA steps in aCSF. Bottom, Voltage response of the same neuron during pharmacological blockade of LVA Ca2+ channels with Ni2+ (100 μm). Blockade of LVA Ca2+ currents abolished RD spiking as indicated by the arrow. F, G, Average number of RD spikes (F) or latency to peak RD response (G) before (open columns) and after (filled columns) application of Ni2+ at three different current levels. H, Average RD area (above resting membrane potential) before (black symbols) and after (gray symbols) application of Ni2+ at three different current levels. I, Top, Voltage response of an SPON neuron to hyperpolarizing current injections in −100 pA steps in aCSF. Bottom, Voltage response of the same neuron during pharmacological blockade of T-type LVA Ca2+ channels with Mibefradil (3 μm). Blockade of T-type LVA Ca2+ currents abolished RD spiking as indicated by the arrow. J, K, Average number of RD spikes (J) or latency to peak RD response (K) before (open columns) and after (filled columns) application of Mibefradil at three different current levels. L, Average RD area (above resting membrane potential) before (black symbols) and after (gray symbols) application of Mibefradil at three different current levels. n = 8, 8, and 6 for the respective experiments. *p < 0.05; **p < 0.01, Student's t test. The residual RD in the presence of ZD7288 (Fig. 4A) indicated that at least one additional current contributes to the response. Blocking LVA Ca2+ currents with Ni2+ (50–300 μm) abolished RD spiking (Fig. 4E; n = 8). Whereas RD spiking (Fig. 4F) and the RD area (Fig. 4H) decreased significantly with Ni2+ application, the latency of the RD was unaffected (Fig. 4G). Mibefradil (3 μm) also abolished rebound spiking (Fig. 4I; n = 6) and had qualitatively similar effects on the RD response as Ni2+ application (Fig. 4J–L). Together, Ih currents and T-type LVA Ca2+ currents are complementary when generating the temporally precise RD spiking in SPON neurons. We recorded responses in vivo from seven neurons in the SPON of young mice (P21–P24; n = 7) to determine the degree to which Ih and LVA Ca2+ currents contributed to sound-evoked spiking. After obtaining responses to a CF pure tone under baseline conditions, either the Ih current blocker ZD7288 or the LVA Ca2+ current blocker Mibefradil was administered alone, followed by the addition of the second drug. The order of drug application was alternated to assess the actions of each drug in isolation. After responses were obtained with both drugs delivered simultaneously, the neuron was allowed to recover. The complete recording procedure, from baseline to recovery, was completed for four neurons, with ZD7288 applied first in two cases and Mibefradil first in the other two cases. A partial protocol was run for an additional three units, in which data from baseline conditions and either the ZD7288 (n = 1) or the Mibefradil (n = 2) condition were collected. However, in these cases, single-unit isolation was lost before application of the second drug. SPON neurons showed distinct changes in spiking behavior after ZD7288 and Mibefradil application (Fig. 5). In one example, a robust offset response was observed with little spiking during the stimulus under baseline conditions (Fig. 5A), but after ZD7288 application, the magnitude of offset spiking decreased and spiking that occurred during the stimulus presentation increased substantially, particularly near the onset of the tone (Fig. 5C). When Mibefradil was added along with ZD7288, virtually all spiking was abolished, apart from a well timed onset response (Fig. 5E). After the drugs were allowed to wash out, a large portion of the offset component recovered, but the response duration remained truncated compared with baseline (Fig. 5A,G). For a second representative SPON unit, Mibefradil was applied first, followed by the addition of ZD7288. In this case, Mibefradil acted to reduce the magnitude and duration of offset spiking and decreased the onset response seen in the baseline condition (Fig. 5B,D). When ZD7288 was added, the offset response was abolished, and the onset response that was reduced by Mibefradil increased (Fig. 5F). After both drugs were removed, the onset and offset responses for this unit recovered to near-baseline levels (Fig. 5H). ZD7288 and Mibefradil alter the spiking of SPON neurons in vivo. A–H, PSTHs were constructed for two SPON units under the following conditions: baseline before the application of drugs (A, B); iontophoretic application of either the Ih current blocker ZD7288 (C) or the LVA Ca2+ blocker Mibefradil (D) in isolation; combined application of both ZD7288 and Mibefradil simultaneously (E, F); and recovery after washout of the drugs (G, H). Horizontal bars show the location of the stimulus in the recording window. I, J, Spike counts (I) and first-spike latencies (J) were measured for offset responses before and during drug application. Error bars represent the SEMs. ZD, ZD7288; Mb, Mibefradil. On average, action potentials occurring in the offset time window (5–35 ms poststimulus) decreased by 53% in the presence of ZD7288 compared with baseline conditions (Fig. 5I), and the application of Mibefradil alone resulted in an even larger reduction (78%) in offset spiking. Moreover, although both ZD7288 and Mibefradil applied in isolation acted to substantially limit the offset response, the combination of both drugs nearly eliminated all poststimulus spiking, with <2% of baseline spikes remaining after the combined drug application. In addition to the offset response, drugs also affected spiking during the stimulus presentation, particularly near the tone onset. The application of Mibefradil alone or ZD7288 plus Mibefradil decreased onset spiking by 91 and 77%, respectively, compared with baseline, similar to what was observed for offset responses (data not shown). However, when ZD7288 was applied alone, spiking during the stimulus presentation increased by 152% (Fig. 5A,C). 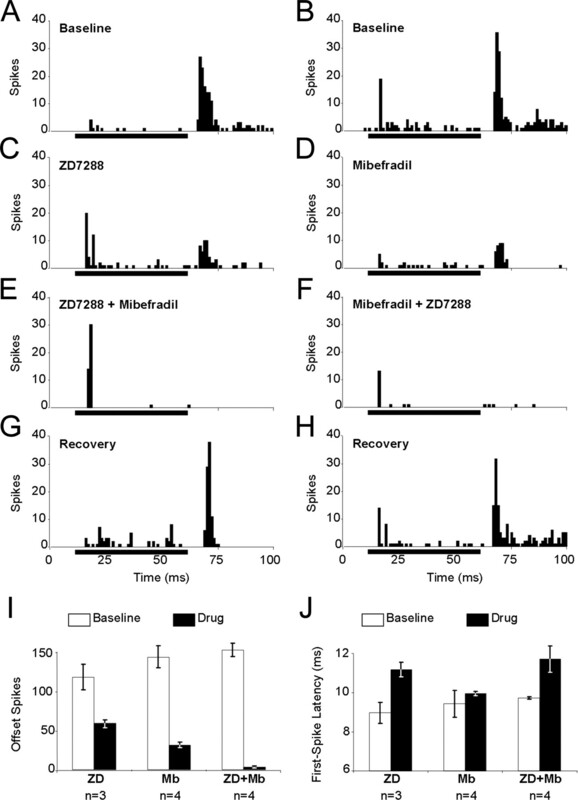 In addition to spike counts, mean first-spike latencies were also measured to determine the impact of each drug on the temporal precision of SPON offset responses (Fig. 5J). The application of ZD7288 alone elevated offset response first-spike latencies by 21% compared with baseline conditions, whereas Mibefradil alone resulted in an increase of only 6%. When ZD7288 and Mibefradil were combined, latencies increased to 18% above baseline. For onset responses, latencies were highly variable, ranging from 6.1 to 17.0 ms, compared with offset latencies, which ranged from 7.9 to 10.3 ms. In all drug conditions, onset response latencies were elevated compared with baseline conditions, even for ZD7288, which caused a substantial increase in onset spiking. The tuning of SPON neurons to acoustic patterns, such as envelope fluctuations demonstrated in vivo, may reflect specialized intrinsic membrane properties. For instance, SPON neurons express very large Ih currents, which are known to underlie slow (typically within θ range) neuronal oscillations in other parts of the brain, such as the cortex, hippocampus, and thalamus (Pape and McCormick, 1989; Strohmann et al., 1994; Dickson et al., 2000; Fisahn et al., 2002, Nolan et al., 2004). We injected currents that increased linearly in frequency between 1 and 15 Hz (chirp stimuli). As expected, the SPON neurons fired action potentials at the peaks of the current chirps, driven by both the peak depolarization and the rebound from the preceding hyperpolarizing trough. To search for a preferred frequency, chirps were first tested at spike threshold followed by a systematic increase in current amplitude. Each SPON neuron displayed its own tuning to these frequency-modulated current injections, evidenced by firing one or a few action potentials at a preferred frequency at current threshold (Fig. 6A). We also noted that the neuron's preferred frequency was independent of the duration of the stimulus (Fig. 6A). Likewise, a reversal of the chirp stimulation, i.e., applying a stimulus with a linearly decreasing frequency, did not affect the tuning of these cells (Fig. 6B). After increasing the current levels, the cell's response became progressively less selective, until it fired at all frequencies. This is illustrated using raster plots of the action potentials in response to increasing stimulus strengths to generate a tuning curve for the neuron (Fig. 6C). To estimate the sharpness of the tuning, the bandwidth at the half-maximal response (also called the Q3dB value) was calculated, yielding an average Q3dB of 6.3 ± 2.9 (n = 6). Temperature-related effects on the intrinsic tuning to the chirps were excluded by recording from SPON neurons at 36°C, yielding no difference in tuning from neurons recorded at room temperature (room temperature: 8.2 ± 0.8 Hz, n = 31; 36°C: 9.0 ± 1.3 Hz, n = 12; p = 0.6). A distribution histogram demonstrates that the entire range of frequencies (1–15Hz) was represented in our sample (Fig. 6D), although there was a tendency for more SPON cells to be tuned to frequencies ≤5 Hz (35%). On average, the intrinsic tuning of SPON neurons was equivalent before (younger than P12: 8.1 ± 0.7 Hz, n = 40) and after (older than P12: 9.9 ± 1.5 Hz, n = 10; p = 0.22) the onset of hearing. We did, however, uncover a significant negative correlation between tuning and input resistance (p < 0.001; Fig. 6E), indicating that voltage-dependent ion conductances are involved in controlling the intrinsic frequency tuning of the SPON neurons. SPON neurons are tuned to frequency-modulated current injections. A, Left, Voltage response of an SPON neuron to a current that increases linearly in frequency (chirp) between 1 and 15 Hz over 2 s with a current amplitude of 400 pA. Note that the neuron only fires an action potential at the end of the stimulation. Right, Extending the duration of the stimulus to 30 s using the same holding current does not affect the frequency tuning of the cell. B, Left, Another SPON neuron is tuned to fire at medium frequencies (freq) to a 1–15 Hz chirp stimulation injection of 30 s at a holding current of 10 pA. Right, Reversal of the chirp, i.e., injection of a stimulus that decreases linearly in frequency between 15 and 1 Hz does not affect the tuning of the neuron. C, Examples of tuning curves that were created by measuring the voltage response to the 30 s, 1–15 Hz chirp at the threshold current and increasing the current stepwise. Raster plots illustrate the progressive loss of frequency selectivity at higher current levels. The best frequency (BF), estimated by converting time to frequency for the first spike or the range of spikes at firing threshold, was 2.5 Hz (left) and 12–15 Hz (right), respectively. 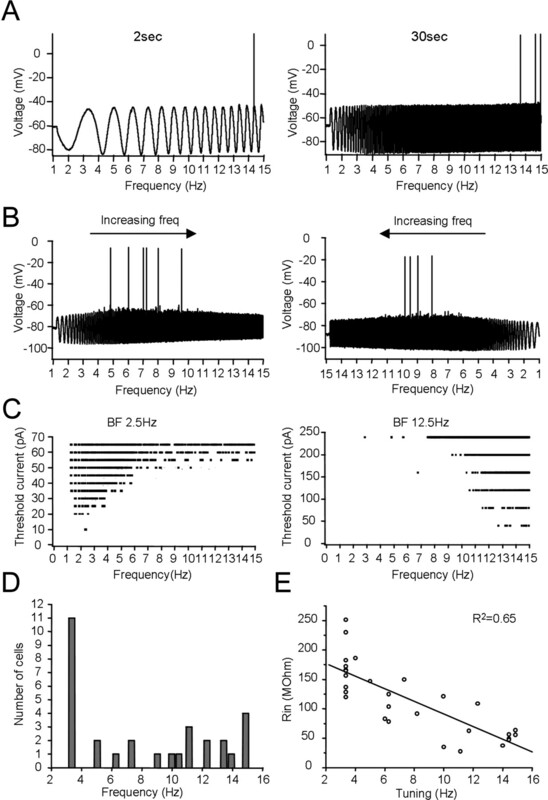 D, A histogram reveals that the intrinsic tuning of SPON cells to chirp stimuli were distributed over the entire bandwith used, although most cells (35%) were tuned to frequencies <5 Hz. E, The input resistance (Rin) of the SPON neurons was negatively correlated with their intrinsic tuning to the chirp stimuli. To assess the ability of SPON neurons to encode low-frequency periodic stimuli in vivo, responses were recorded from neurons in young (P20–P22, n = 13) and in adult (P58–P80, n = 19) mice, with CFs ranging from 11 to 40 kHz. Each unit was presented with SAM tones, with the carrier frequency set to the unit's CF and the MF systematically varied from 1 to 20 Hz. Two types of SAM responses were frequently observed for neurons in both young and adult animals. One type was marked by significant phase-locked spiking to SAM tones with low MFs (Rayleigh test, p < 0.05) and a pronounced decrease in entrainment to cycles of MFs above ∼15 Hz; this type of modulation transfer function was observed in 38% of units in young animals (Fig. 7A) and in 42% of units in adult animals (Fig. 7B). A second type of SAM response, seen in 62 and 58% of units in young (Fig. 7C) and adult (Fig. 7D) animals, respectively, displayed significant phase-locking to all MFs presented. In addition, all neurons that responded to low MFs did so with clustered spiking restricted to approximately one-third of each modulation cycle, as shown by period histograms (Fig. 7, PSTH insets). SPON neurons exhibited two types of modulation transfer functions in response to SAM stimuli in vivo. A, B, One response type observed in SPON neurons of both young (A) (P20–P22; n = 5) and adult (B) (P58–P80; n = 8) animals was marked by temporally precise spiking to each modulation cycle of SAM tones ranging from 1 to 15 Hz, with a sharp decrease phase-locking to modulation frequencies above 15 Hz. C, D, A second type of response to SAM stimuli seen for neurons in young (C) (n = 8) and adult (D) (n = 11) animals consisted of phase-locked spiking to all modulation frequencies presented. Horizontal rippled bars in A–D represent the location of the SAM tone in the recording window. Period histograms (insets) were constructed from spikes that occurred during the stimulus presentation. E, Percentage of neurons in young and adult animals that demonstrated phase-locked responses to SAM stimuli as a function of modulation frequency, as indicated by a significant result of the Rayleigh test. F, G, Mean vector strengths for young (n = 13) and adult (n = 19) neurons in response to low (F) and higher (G) modulation frequencies. Error bars represent the SEMs. mod, Modulation; VS, vector strength. In both young and adult animals, the highest percentage of phase-locked responses for SPON neurons occurred from 5 to 15 Hz (Fig. 7E). Overall, phase-locking did not significantly differ between units in young and adult animals at any of the MFs tested (1–600 Hz; Mann–Whitney U test, p = 0.07–0.95). However, at very low MFs (1–5 Hz), vector strengths in young animals were noticeably higher than in adults (Mann–Whitney U test, p = 0.07–0.13; Fig. 7F). In all but two cases, neurons that phase-locked to MFs up to 20 Hz (Fig. 7C,D) continued to exhibit significant entrainment to SAM modulations up to 200–400 Hz (Fig. 7G), similar to the phase-locking reported in neurons of the rat SPON (Kulesza et al., 2003; Kadner and Berrebi, 2008). 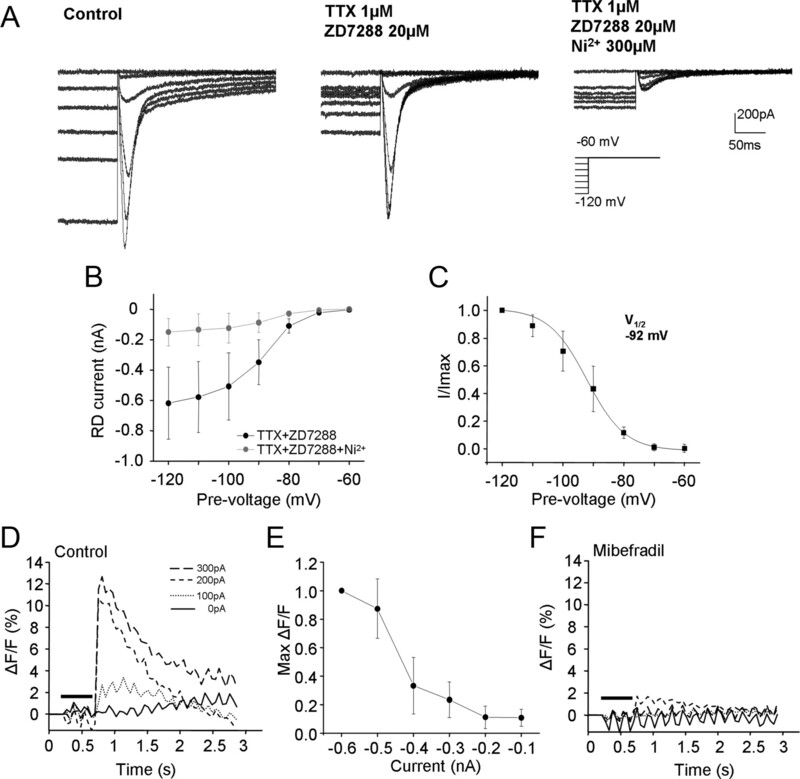 To assess the effects of Ih and LVA Ca2+ currents on the behavior of SPON neurons to periodic stimuli in vivo, responses to SAM stimuli were recorded before, during, and after the application of ZD7288 and/or Mibefradil (Fig. 8). In an example in which ZD7288 was applied first, we observed decreased spiking and phase-locking (Fig. 8A,C). In addition, ZD7288 acted to reduce the range of MFs over which the neuron phase-locked, limiting entrainment to MFs of 1–4 Hz, down from 1–15 Hz in baseline recordings. This finding indicates that Ih is only partially involved in determining the MF tuning of SPON neurons. When Mibefradil was added along with ZD7288, spiking was dramatically reduced, and phase-locking to all MFs was abolished (Fig. 8E). After allowing the drugs to wash out for 1 h, both vector strengths and spiking partially recovered (Fig. 8G). For a second unit, Mibefradil was applied first, resulting in decreased spiking and entrainment to SAM tones (Fig. 8B,D). Although vector strengths of responses to MFs of 6–12 Hz were lower in the presence of Mibefradil, they were still significantly phase-locked to the SAM stimuli (Rayleigh test; p = 0.01–0.001). However, when ZD7288 was combined with Mibedfradil, the spiking rate of the neuron was further reduced, and phase-locking was abolished at all MFs presented (Fig. 8F). After a period of recovery from the drugs, vector strengths returned toward baseline levels, but spiking remained depressed (Fig. 8H). These data demonstrate that the same ion currents that underlie the RD response in vitro are crucial for generating the offset response to tones in vivo. Ih and LVA Ca2+ currents contribute to SAM tuning in vivo. Spike rate and vector strength modulation transfer functions (right), along with representative PSTHs (left; p values obtained from the Rayleigh test), are shown for responses to SAM tones recorded from two units under the following conditions: baseline before the application of drugs (A, B);either the Ih current blocker ZD7288 (C) or the LVA Ca2+ blocker Mibefradil (D) in isolation; combined application of both ZD7288 and Mibefradil simultaneously (E, F); and recovery after washout of the drugs (G, H). Horizontal rippled bars in each PSTH plot represent the location of the SAM tone in the recording window. Asterisks indicate significant phase-locking as determined by the Rayleigh test (p < 0.05). mod, Modulation; VS, vector strength. This study represents the first in vitro investigation of properties of SPON neurons. Here, we describe ionic currents mediating their prominent postinhibitory response, which presumably underlies the offset spiking observed in vivo (Kuwada and Batra, 1999; Dehmel et al., 2002; Kulesza et al., 2003, 2007; Kadner et al., 2006; Kadner and Berrebi, 2008). When released from hyperpolarizing currents, the membrane voltage of these cells rebounded (depolarized) to spike threshold because of activation of two ion currents, Ih and T-type Ca2+ currents that operate at subthreshold voltages. The opening of these channels caused the neurons to fire a brief burst of action potentials, similar to the offset spiking patterns of SPON units in vivo. 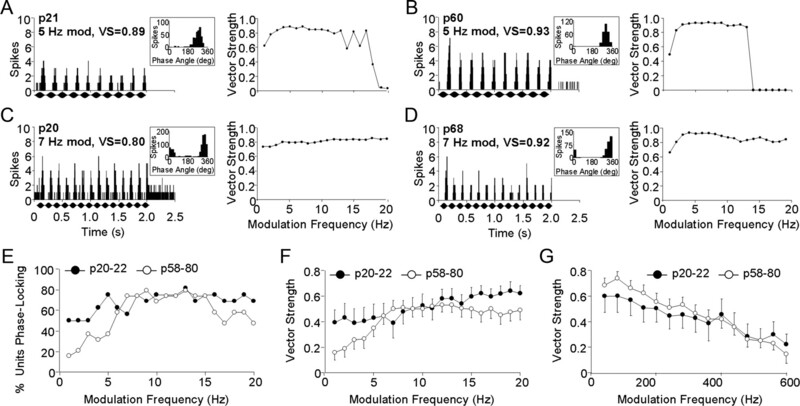 Interestingly, SPON neurons displayed intrinsic tuning to frequency-modulated sinusoidal currents, and recordings conducted in vivo demonstrated synchronous firing to low-rate sound envelope modulations. Together, these properties show that SPON neurons are particularly well suited for encoding the timing and shape of acoustic periodicity. The postinhibitory rebound response observed in SPON neurons in vitro is highly consistent, containing only a few well timed spikes triggered by the stimulus offset. The hyperpolarization necessary to generate the rebound in vivo is likely provided by a feedforward glycinergic inhibition from the MNTB (for review, Kulesza et al., 2007). This tonic inhibition, which prevents SPON neurons from discharging during sound presentation (Kadner et al., 2006; Kulesza et al., 2007; Kadner and Berrebi, 2008), presumably tunes voltage-gated ion currents to their optimal working range. After release from this inhibition, these currents cause rapid depolarization of the neuron, which triggers precisely timed rebound spiking. The inwardly rectifying Ih current is particularly important for determining the timing of the rebound response, because its pharmacological blockade increases both the latency of the RD in vitro and the offset response in vivo (present results), as well as in the inferior colliculus (Sun and Wu, 2008). It is possible that the Ih current suppresses long-latency and temporally variable firing during the postinhibitory rebound response by decreasing the dendritic membrane resistance (Endo et al., 2008). The LVA T-type Ca2+ current also contributes to the rebound response by reactivating during hyperpolarization, when the membrane potential returns toward rest (Perez-Reyes, 2003). Thus, after the hyperpolarization, Ca2+ currents act in tandem with Ih currents to boost the RD to reach spike threshold (Luthi and McCormick, 1998). In line with this idea, rebound spiking was abolished in vitro when the LVA T-type Ca2+ current was blocked by Ni2+ or Mibefradil. Similarly, spiking was significantly reduced without significant changes in latency and response duration after Mibefradil application in vivo. The variability in the number of spikes observed during the rebound could be related to the relative amount of T-type Ca2+ currents or the expression of Cav3 channel subtypes in SPON neurons, as has been reported in postinhibitory rebound firing in deep cerebellar nuclei (Molineux et al., 2006). The fact that RDs trigger very few spikes in the SPON implies that additional ion conductances, such as voltage-gated K+ channels (Kanold and Manis, 2001; Hooper et al., 2009) or Ca2+-activated K+ channels (Kim and Trussell, 2007) that activate at more depolarized voltages, may influence the timing and/or the duration of the rebound response. In addition, geometrical variations in the size or the number of dendrites (Mainen and Sejnowski, 1996) or synaptic activity levels could influence the shape of the rebound response. For instance, recurrent GABAergic inhibition from neighboring SPON neurons (Kulesza et al., 2007), or retrograde release from cells onto themselves (auto-inhibition), as has been demonstrated in the LSO (Magnusson et al., 2008), could provide feedback control and limit the duration of rebound firing. Our data demonstrate that SPON neurons are intrinsically tuned to frequency-modulated periodic electrical currents. A similar type of intrinsic cellular frequency tuning has been found in the weakly electric fish, in which the sensory cells detect and encode the beat rate of electrolocation cues (Fortune and Rose, 1997). Some of these sensory neurons exhibit low-pass tuning to sinusoidally modulated linear current sweeps from 2 to 30 Hz, which was partially attributed to active conductances in combination with passive electrical filtering (i.e., capacitance and leak currents) (Rose and Fortune, 1999). In addition, activity-dependent depression of synaptic inputs has been proposed as another mechanism for preserving low-frequency information (Fortune and Rose, 2001). The contribution of network properties to the tuning characteristics of SPON neurons to frequency-modulated electrical currents was not assessed in the present study. However, it is conceivable that frequency tuning of the afferent input or gain–control mechanisms of synaptic efficacy will enhance the frequency tuning to periodic stimuli in the SPON. Their selectivity to oscillating currents likely makes SPON neurons sensitive to temporal patterns, such as low-frequency envelope fluctuations in acoustic signals. This is demonstrated by their excellent ability to phase-lock to low-rate, sinusoidally amplitude-modulated stimuli in vivo. The fact that SPON neurons generally respond with high synchronicity to modulation frequencies up to ∼400 Hz in vivo and are intrinsically tuned to much lower frequencies (<20 Hz) in vitro could be related to a number of factors. First, the in vitro preparation does not take possible input-specific or network properties, as mentioned above, into account. Second, it is likely that active conductances also contribute greatly to the tuning to frequency-modulated sinusoidal currents in SPON neurons, as evidenced by the correlation between their frequency tuning and input resistance. Such voltage-dependent currents may be subject to developmental regulation in their magnitude, ion channel subunit composition, and geometrical arrangements of ion channels, which may affect the sensitivity for temporal fluctuations of sound envelopes in the SPON. 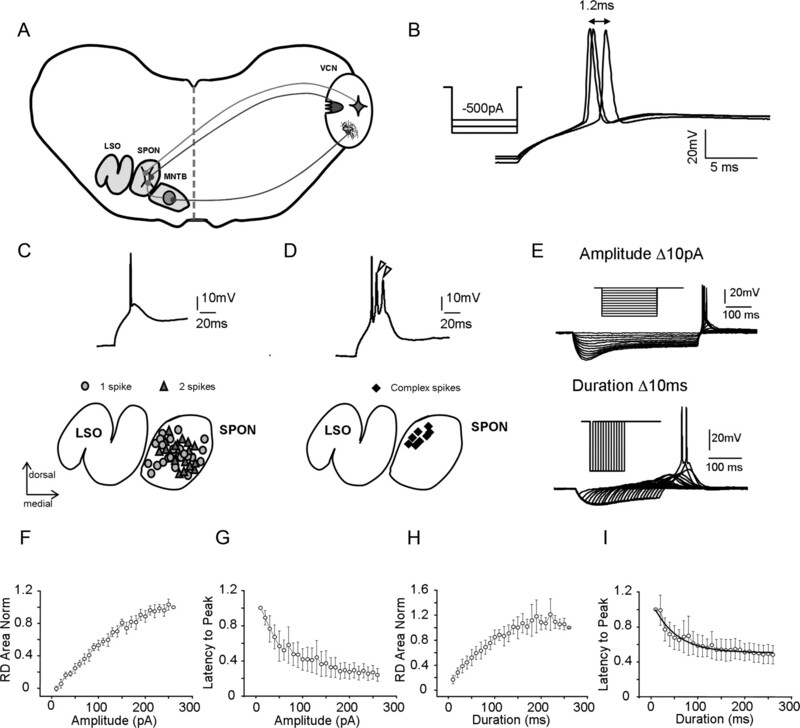 It is important to note that SPON neurons are not behaving as pacemaker neurons with spontaneous oscillations (Llinas et al., 1991), which underlies thalamocortical rhythmical activity (Steriade et al., 1993). Whether biophysical properties and frequency tuning to oscillating current injections manifest themselves as an intrinsic electrical resonance of subthreshold voltage (Strohmann et al., 1994; Gutfreund et al., 1995; Ulrich, 2002; Hu et al. ; 2002) remains a topic of investigation. By discharging with precision to amplitude-modulated tones, SPON neurons transmit precise temporal information about sound envelopes to higher-order brain areas (Kuwada and Batra, 1999; Kadner and Berrebi, 2008). SPON neurons respond with notable fidelity to modulation frequencies up to a few hundred hertz (Kuwada and Batra, 1999; Felix and Berrebi, 2007; Kadner and Berrebi, 2008), corresponding to the range of envelope fluctuations that convey critical information in many animal vocalizations and speech sounds (Rosen, 1992). The in vivo results of the present study confirm that SPON neurons phase-lock to low-frequency modulations of the sound envelope (<20 Hz) and that certain cells (∼40%) show preferential tuning to these low rates of modulation. In the mouse, the encoding of periodic low-frequency modulations could be relevant for various communication calls, such as wriggling calls, characterized as single-frequency pup whistles that are vocalized at a repetition rate of 3–10 Hz (Geissler and Ehret, 2002; Liu et al., 2006; Portfors, 2007). The high degree of precision in the response of SPON neurons to changes in the sound envelope makes them attractive candidates for involvement in temporal processing. However, little is known concerning the impact of SPON projections on their synaptic targets in the ipsilateral inferior colliculus (Kelly et al., 1998; Saldana and Berrebi, 2000; Saldana et al., 2009). One idea is that the SPON serves as a sensitive detector of discontinuities within ongoing stimuli, e.g., by signaling troughs in amplitude-modulated sounds or brief gaps between sounds (Kadner and Berrebi, 2008). Because SPON neurons are GABAergic, their offset spikes are expected to provide brief bursts of synaptic inhibition that would act to segment responses of inferior colliculus neurons to periodically modulated signals. The fact that SPON and inferior colliculus neurons are sensitive to similar ranges of envelope modulation frequencies (Kuwada and Batra, 1999; Krishna and Semple, 2000), and that pharmacologic blockade of GABA receptors in the inferior colliculus can selectively affect the responses to SAM tones (Palombi and Caspary, 1996; Koch and Grothe, 1998; Lu et al., 1998, Zhang and Kelly, 2003), particularly at modulation frequencies below 30 Hz (Caspary et al., 2002), suggests that the SPON has a role in shaping the representation of periodic stimuli in the midbrain. Investigations of the superior olivary complex have traditionally focused on the processing of binaural sounds. However, psychoacoustic evidence suggests that human speech perception under reverberant conditions relies primarily on monaural processing (Plomp, 1976; Culling et al., 2003). In the SPON, low-frequency periodic fluctuations of a monaural inhibitory input are converted into spikes that fire in synchrony with the stimulus waveform. Thus, monaural signaling of temporal acoustic patterns, such as envelope fluctuations, positions the SPON to serve as an early locus for extracting rhythm and pitch information and may constitute an important part of a neural circuit devoted to speech perception. This work was supported by grants from the Swedish Research Council [Grants 80326601 (A.K.M.) and K2008-63X-14061-08-3 (A.F. )]; the Åke Wibergs Stiftelse, Jeanssons Stiftelse, Magnus Bergvalls Stiftelse; Hörselskadades Riksförbund, Tysta Skolan to A.K.M. ; and the National Institute on Deafness and Other Communication Disorders (Grant RO1 DC-002266 to A.S.B.). (1981) Circular statistics in biology (Academic, London). (2003) Characterization of the human superior olivary complex by calcium binding proteins and neurofilament H (SMI-32) J Comp Neurol 456:292–303. (2002) Auditory response properties in the superior paraolivary nucleus of the gerbil. J Neurophysiol 87:2915–2928. (1995) Voltage-dependent blockade of diverse types of voltage-gated Ca2+ channels expressed in Xenopus oocytes by the Ca2+ channel antagonist mibefradil (Ro 40–5967) Mol Pharmacol 48:540–549. (2002) GABAergic inputs shape responses to amplitude modulated stimuli in the inferior colliculus. Hear Res 168:163–173. (2001) Properties of hyperpolarization-activated pacemaker current defined by coassembly of HCN1 and HCN2 subunits and basal modulation by cyclic nucleotide. J Gen Physiol 117:491–504. (2003) Effects of reverberation on perceptual segregation of competing voices. J Acoust Soc Am 114:2871–2876. (2002) Electrophysiological characterization of the superior paraolivary nucleus in the Mongolian gerbil. Hear Res 172:18–36. (2000) Properties and role of I(h) in the pacing of subthreshold oscillations in entorhinal cortex layer II neurons. J Neurophysiol 83:2562–2579. (2008) Dendritic Ih ensures high-fidelity dendritic spike responses of motion-sensitive neurons in rat superior colliculus. J Neurophysiol 99:2066–2076. (2007) Characterization of the superior paraolivary nucleus in the unanesthetized mouse. Assoc Res Otolaryngol Abstr 30:496. (2002) Muscarinic induction of hippocampal gamma oscillations requires coupling of the M1 receptor to two mixed cation currents. Neuron 33:615–624. (1997) Passive and active membrane properties contribute to the temporal filtering properties of midbrain neurons in vivo. J Neurosci 17:3815–3825. (2001) Short-term synaptic plasticity as a temporal filter. Trends Neurosci 24:381–385. (1988) Divergent projections of physiologically characterized rat ventral cochlear nucleus neurons as shown by intra-axonal injection of horseradish peroxidase. Exp Brain Res 73:263–284. (2002) Time-critical integration of formants for perception of communication calls in mice. Proc Natl Acad Sci U S A 99:9021–9025. (2010) Mechanisms of sound localization in mammals. Physiol Rev 90:983–1012. (1995) Subthreshold oscillations and resonant frequency in guinea-pig cortical neurons: physiology and modelling. J Physiol 483:621–640. (1980) A simple technique for constructing “piggy-back” multibarrel microelectrodes. Electroencephalogr Clin Neurophysiol 48:249–251. (2009) Slow conductances could underlie intrinsic phase-maintaining properties of isolated lobster (Panulirus interruptus) pyloric neurons. J Neurosci 29:1834–1845. (2002) Two forms of electrical resonance at theta frequencies, generated by M-current, h-current and persistent Na+ current in rat hippocampal pyramidal cells. J Physiol 545:783–805. (2008) Encoding of temporal features of auditory stimuli in the medial nucleus of the trapezoid body and superior paraolivary nucleus of the rat. Neuroscience 151:868–887. (2006) Neurons in the medial nucleus of the trapezoid body and superior paraolivary nucleus of the rat may play a role in sound duration coding. J Neurophysiol 95:1499–1508. (2001) A physiologically based model of discharge pattern regulation by transient K+ currents in cochlear nucleus pyramidal cells. J Neurophysiol 85:523–538. (1998) Projections from the superior olive and lateral lemniscus to tonotopic regions of the rat's inferior colliculus. Hear Res 116:43–54. (2007) Ion channels generating complex spikes in cartwheel cells of the dorsal cochlear nucleus. J Neurophysiol 97:1705–1725. (1998) GABAergic and glycinergic inhibition sharpens tuning for frequency modulations in the inferior colliculus of the big brown bat. J Neurophysiol 80:71–82. (2003) Hyperpolarization-activated current (Ih) in the inferior colliculus: distribution and contribution to temporal processing. J Neurophysiol 90:3679–3687. (2004) Distribution of HCN1 and HCN2 in rat auditory brainstem nuclei. Eur J Neurosci 20:79–91. (2000) Auditory temporal processing: responses to sinusoidally amplitude-modulated tones in the inferior colliculus. J Neurophysiol 84:255–273. (2008) Cytoarchitecture of the human superior olivary complex: nuclei of the trapezoid body and posterior tier. Hear Res 241:52–63. (2003) Physiological response properties of neurons in the superior paraolivary nucleus of the rat. J Neurophysiol 89:2299–2312. (2007) Distinct roles for glycine and GABA in shaping the response properties of neurons in the superior paraolivary nucleus of the rat. J Neurophysiol 97:1610–1620. (2010) Malformation of the human superior olive in autistic spectrum disorders. Brain Res 1367:360–371. (1991) Afferents to the medial nucleus of the trapezoid body and their collateral projections. J Comp Neurol 314:684–706. (1999) Coding of sound envelopes by inhibitory rebound in neurons of the superior olivary complex in the unanesthetized rabbit. J Neurosci 19:2273–2287. (2006) Improved cortical entrainment to infant communication calls in mothers compared with virgin mice. Eur J Neurosci 23:3087–3097. (1991) In vitro neurons in mammalian cortical layer 4 exhibit intrinsic oscillatory activity in the 10- to 50-Hz frequency range. Proc Natl Acad Sci U S A 88:897–901. (1998) GABAergic disinhibition affects responses of bat inferior collicular neurons to temporally patterned sound pulses. J Neurophysiol 79:2303–2315. (1998) Periodicity of thalamic synchronized oscillations: the role of Ca2+-mediated upregulation of Ih. Neuron 20:553–563. (2008) Retrograde GABA signaling adjusts sound localization by balancing excitation and inhibition in the brainstem. Neuron 59:125–137. (2006) Specific T-type calcium channel isoforms are associated with distinct burst phenotypes in deep cerebellar nuclear neurons. Proc Natl Acad Sci U S A 103:5555–5560. (1983) Strychnine blocks binaural inhibition in lateral superior olivary neurons. J Neurosci 3:237–242. (2010) In vivo dynamic clamp study of I(h) in the mouse inferior colliculus. J Neurophysiol 104:940–948. (2004) A behavioral role for dendritic integration: HCN1 channels constrain spatial memory and plasticity at inputs to distal dendrites of CA1 pyramidal neurons. Cell 119:719–732. (2004) Immunohistochemical localization of Ih channel subunits, HCN1–4, in the rat brain. J Comp Neurol 471:241–276. (1996) GABA inputs control discharge rate primarily within frequency receptive fields of inferior colliculus neurons. J Neurophysiol 75:2211–2219. (1989) Noradrenaline and serotonin selectively modulate thalamic burst firing by enhancing a hyperpolarization-activated cation current. Nature 340:715–718. (1976) Binaural and monaural speech intelligibility of connected discourse in reverberation as a function of a single competing sound source (speech or noise) Acustica 34:200–211. (2007) Types and functions of ultrasonic vocalizations in laboratory rats and mice. J Am Assoc Lab Anim Sci 46:28–34. (2005) Spectral integration in the inferior colliculus of the CBA/CaJ mouse. Neuroscience 136:1159–1170. (1999) Frequency-dependent PSP depression contributes to low-pass temporal filtering in Eigenmannia. J Neurosci 19:7629–7639. (2000) Anisotropic organization of the rat superior paraolivary nucleus. Anat Embryol (Berl) 202:265–279. (2009) Connections of the superior paraolivary nucleus of the rat: projections to the inferior colliculus. Neuroscience 163:372–387. (2010) Distribution of perineuronal nets in the human superior olivary complex. Hear Res 265:15–24. (1995) Projections from the cochlear nucleus to the superior paraolivary nucleus in guinea pigs. J Comp Neurol 360:135–149. (2001) Distinct K currents result in physiologically distinct cell types in the inferior colliculus of the rat. J Neurosci 21:2861–2877. (1998) Anatomy and physiology of principal cells of the medial nucleus of the trapezoid body (MNTB) of the cat. J Neurophysiol 79:3127–3142. (1993) Principal cells of the rat medial nucleus of the trapezoid body: an intracellular in vivo study of their physiology and morphology. Exp Brain Res 95:223–239. (1993) The slow (<1 Hz) oscillation in reticular thalamic and thalamocortical neurons: scenario of sleep rhythm generation in interacting thalamic and neocortical networks. J Neurosci 13:3284–3299. (1994) Subthreshold frequency selectivity in avian auditory thalamus. J Neurophysiol 71:1361–1372. (2008) Modification of membrane excitability of neurons in the rat's dorsal cortex of the inferior colliculus by preceding hyperpolarization. Neuroscience 154:257–272. (2007) Membrane properties and firing patterns of inferior colliculus neurons: an in vivo patch-clamp study in rodents. J Neurophysiol 98:443–453. (1991) Projections from the posteroventral cochlear nucleus to the superior olivary complex in guinea pig: light and EM observations with the PHA-L method. J Comp Neurol 311:495–508. (2003) The lateral superior olive: a functional role in sound source localization. Neuroscientist 9:127–143. (2001) Gi- and Gs-coupled receptors up-regulate the cAMP cascade to modulate HCN2, but not HCN1 pacemaker channels. Pflugers Arch 442:928–942. (2002) Dendritic resonance in rat neocortical pyramidal cells. J Neurophysiol 87:2753–2759. (2003) Glutamatergic and GABAergic regulation of neural responses in inferior colliculus to amplitude-modulated sounds. J Neurophysiol 90:477–490.